(MENAFN - Colombo Gazette) A Sri Lankan delegation had talks with officials in Tamil Nadu on the refugee issue. Sri Lanka's High Commissioner to India Austin Fernando was on a working visit to Southern India to participate in the Special Consular service program at the Sri Lanka Deputy High Commission in Chennai from 07-10 February 2019, the Foreign Ministry said today. The program brought together a te am from Sri Lanka representing the Registrar General's Office and Department of Immigration and Emigration headed by Controller General, M.N. Ranasinghe and Additional Secretary (Bilateral Affairs), Ministry of Foreign Affairs, Sumith Nakandala. The High Commissioner held a meeting with the officials from Sri Lanka and from the Sri Lankan Mission in Chennai and discussed the need to examine complicated cases with regard to providing birth certificates and citizenship certificates to Sri Lankan refugees on Indian soil. 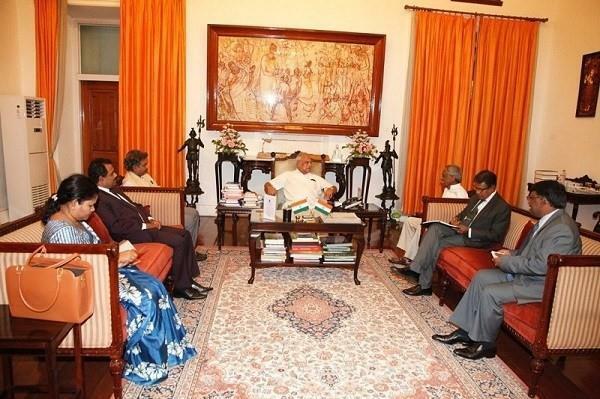 He also discussed the issues pertaining to the voluntary repatriation process of the Sri Lankan refugees. He met with functionaries working with refugees, the Consular Division of the Chennai Mission and officials from Sri Lanka. The High Commissioner addressed the gathering of Sri Lankan refugees, stating that he understood their problems and that the Government of Sri Lanka is committed in bringing a solution to the issues they faced. The three day program began with a visit to the Maha Bodhi in Chennai and a call on OfERR, a leading organization working with refugees. High Commissioner Austin Fernando also paid courtesy calls on Banwarilal Purohit, Governor of Tamil Nadu at Raj Bhavan Chennai and Dr. (TMT) Girija Vaidhyanathan IAS, Chief Secretary to the Government of Tamil Nadu at Tamil Nadu Secretariat on 09th February 2019 and held cordial discussions. He conveyed Sri Lanka's interest in developing closer bilateral cooperation in regard to the voluntary repatriation of Sri Lankan nationals. A debriefing session was held on 10th February 2019 where the Controller General, Mr. M.N. Ranasinghe and Sumith Nakandala explained the preparation for the return of refugees and follow up action.